OCEAN BEACH, CA. 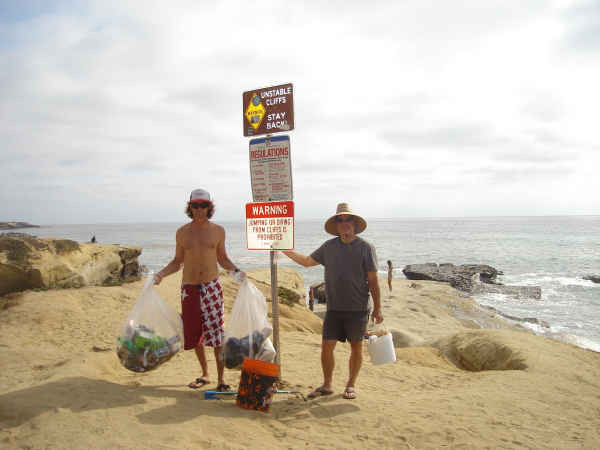 As litter never ends and graffiti tagging seems endless along sections of Sunset Cliffs, another clean-up happened on Friday, August 14th. Jon Carr with his trusty roller. He comes out here every work day and does quick patch-up jobs. As this one was organized by a group calling themselves “The Cliff Dwellers”, and headed up by long-time local and cliff expert, Larry OB, a bunch of us OB Ragsters joined them after work at the foot of Santa Cruz Avenue. Jon, Dave, Patty and I met Larry, Matt and Greg along the sandstone marvels in our front yard, and with plastic bags, paint rollers, scrub brushes and a picker proceeded to work ourselves north up to the Pier. The pocket parks at Santa Cruz were particularly trashy, and there were cigarette butts everywhere. Along the way, we encouraged families and kids to take their trash out – and a lot thanked us and said they appreciated what we were doing. Larry OB has to use a scrub brush on this patch of painted graffiti. 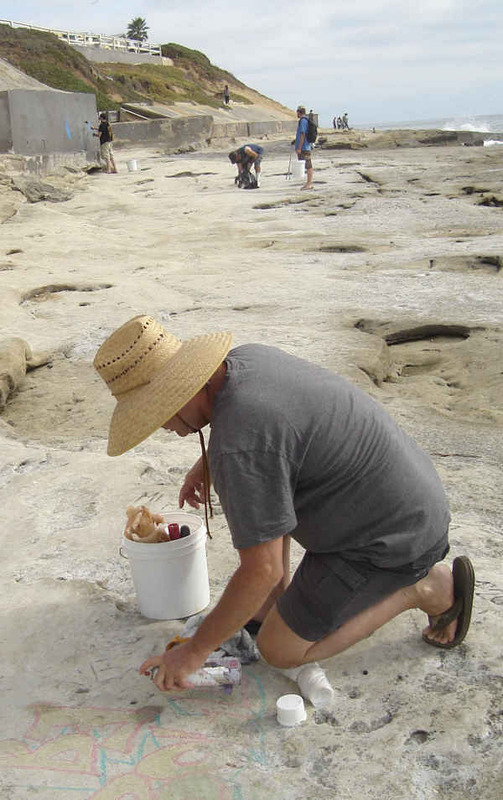 In order to take it off, he had to remove the top layer of sandstone. We ran into three police officers – one who reported to us that he had arrested a young man just the day before for large-lettered graffiti right on the cliffs themselves, south of Ladera Street. With Jon’s roller smothering the few tags we saw, and Matt, Patty, Greg and Larry’s persistence in going after everything, numerous large bags were filled up. Matt and Larry OB display part of the day's catch at the foot of Santa Cruz. And we made a difference. Walking back along our path after it was over, I couldn’t help but marvel at how clean things looked. It never looked so good, I thought. And nature was smiling back. it was great to do a rubbish rumble with you guys yesterday. Let me know of any more group events. Or maybe I’ll see you doing a solo sometime. 1. Do a job on the sand at Santa Cruz to remove charcaol (fire) bits, because they look bad and they are also a graffitti tool. No date yet. 2. The annual Gromfest surf contest is Saturday Aug. 29th at Sourth OB. I’ll probably be down there at 7 AM to clean the shoreline for whatever and check the lots for broken glass. 3. How about a restoration of the big sandboax at the Silver Spray? The pickleweed could be transplanted elsewhere, like above the seawalls where we have bare dirt. Possibly a bucket brigade to get some sand up from the beachand into the sandbox. Date…mid November to take advantage of rainfall for pickleweed cuttings. 4. End of the Summer party for us workers at Santa Cruz or Bermuda. Date…mid Sept?? Skinny P!!! Thanks for the shout out bro. I will make sure I get you on the mailing list. You outsider…. Hell of a job. Thank you all. Thank you Rob! Feel free to come out and join us one of these times. We try to make it a fun event. More and more locals are getting together and our work is really starting to show down there. It’s also a great opportunity to meet your neighbors, share ideas and raise awareness of important local issues. 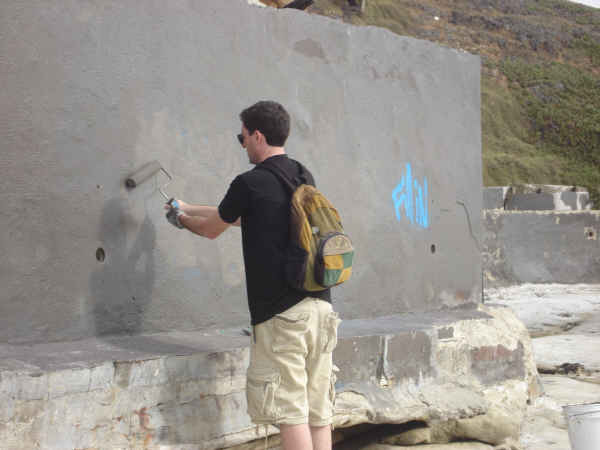 Apparently, Jon is one of our unsung heroes – thanx to him and people like Larry, Matt, Greg, Ed – they go out of their way every week to ensure that graffiti and litter are not evident along the cliffs. Jon takes out his roller with paint before work. Geez! CAn’t you get enuff grief from work – ya halfda get some from the work (litter and tags) of others. Thanks Jon for your unsung work to brighten up our community. When and where is the next clean up? I personally don’t have a date scheduled yet. I go by myself or with one or two others at least twice a week, and I always have tag remover with me while cruising around town. Unfortunately I can’t sample their beers since I’m volunteering, but it should be fun and it supports many great causes. If you’re really gung-ho, and want to get together over the weekend, send the obrag a message and I will pick up your email address and get you on the mailing list. We are always happy to have extra motivated volunteers and you will be notified of the next event and any smaller clean-ups as well. Thanks Rob!